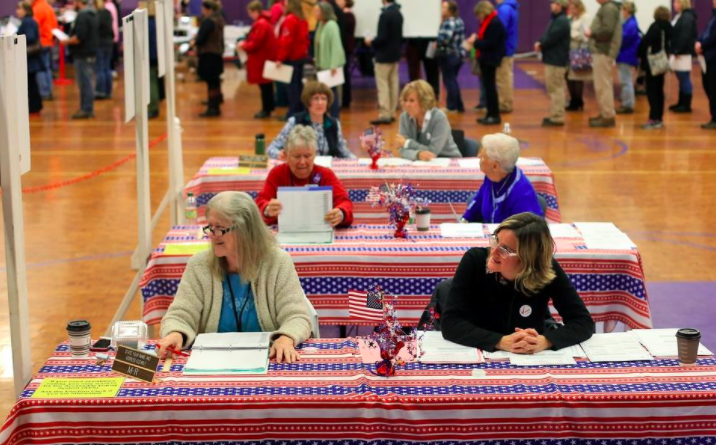 Voters wait to cast their ballots as election clerks call up the next residents at Marshwood Middle School in Eliot Tuesday. ELIOT, Maine — Voters approved by non-binding referendum Tuesday the creation of licensing standards for the sales of adult recreational marijuana. State legislation allows recreational retail stores in towns that create licensing standards. Without the creation of those standards, a town would automatically not allow retail marijuana stores. The non-binding question said retail sales would be in the commercial/industrial district. The vote was 1,742 yes, 1,163 no. In anticipation of creating standards for retail marijuana sales the Select Board has created an ad hoc Adult Use Recreational Cannabis Committee. Voters endorsed the York River Study Committee’s recommendation to seek Partnership Wild and Scenic River designation, by the U.S. Congress, for the York River and its tributaries. This would provide financial services, technical assistance and a local structure to best enable implementation of the York River Watershed Stewardship Plan for Eliot, York, Kittery and South Berwick. All four towns were asked to endorse the plan. In Eliot, the vote was 2,501 yes, 933 no. Robert McPherson was elected to the Select Board, the only nominee for an open seat on the board. The seat has been open since June and the remainder of that term is to June 2020. There were several write-in candidates for an open seat on the Budget Committee, a term that ends in June 2019. Town Clerk Wendy Rawski said the result would be announced Wednesday morning, after she can certify the votes. — Amending the referendum town meeting ordinance by consolidating or shifting some budget items, changing the name of the Board of Selectmen to the Select Board and clarifying budget funding provisions. — Updating shoreland zoning to be consistent with 2015 Maine Department of Environmental Protection guidelines. — Changing the word “application” to “permit” in the Growth Permit issuance procedure. — Revising “Dimensional Standards” for lots and structures. Voters approved the option to require local write-in candidates to declare their candidacy by filing with the town clerk at least 60 days before the election, as is now required for state write-in candidates. Previously, in Eliot, write-in candidates did not have to declare.